The mission of Longleaf Golf & Family Club is simple: implement the best practices that make golf enjoyable, practical, and affordable to all members of the family. As part of Longleaf’s mission to help every family enjoy golf more, we have installed the “Longleaf Tee System” with multiple tee locations based on a player’s average driving distance. With new MiniVerde Bermuda greens golfers of all ages will get tested in all facets of their game but still be able to have fun, and have more opportunities for pars and birdies. 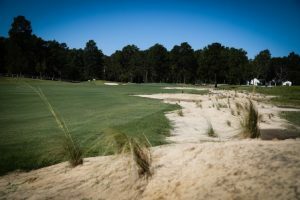 Then after your round you can play the short course, Bottlebrush, which is the first short course in the Sandhills area. With 6 holes ranging from 50-100 yards, it is the perfect way to get a little more action in before the day is over. To end the day, stop into the new restaurant, Heartwood Grill & Greens for a great meal, then putt on the 9 Hole putting course on a completely lit up 10,000 square foot green and enjoy a cocktail by the fire pit. It is a truly a magical experience.